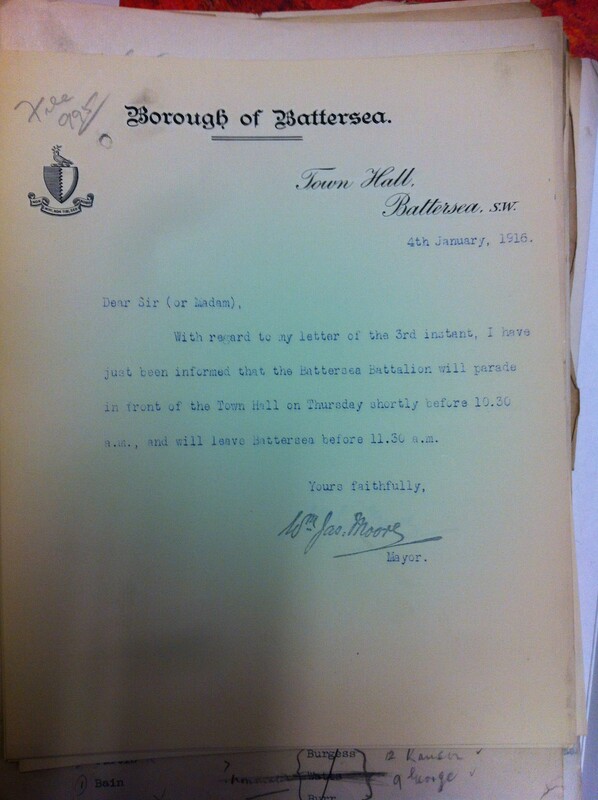 On 29th December 1915, the Mayor of Battersea was informed that the time for the Battersea Battalion to be mobilised was likely to be early January, and on 3rd January it was confirmed by telegram that the Battalion would move to Aldershot on the 6th. The 10th (Service) Battersea Royal West Surrey Battalion was to leave from Waterloo along with the 11th Battalion. 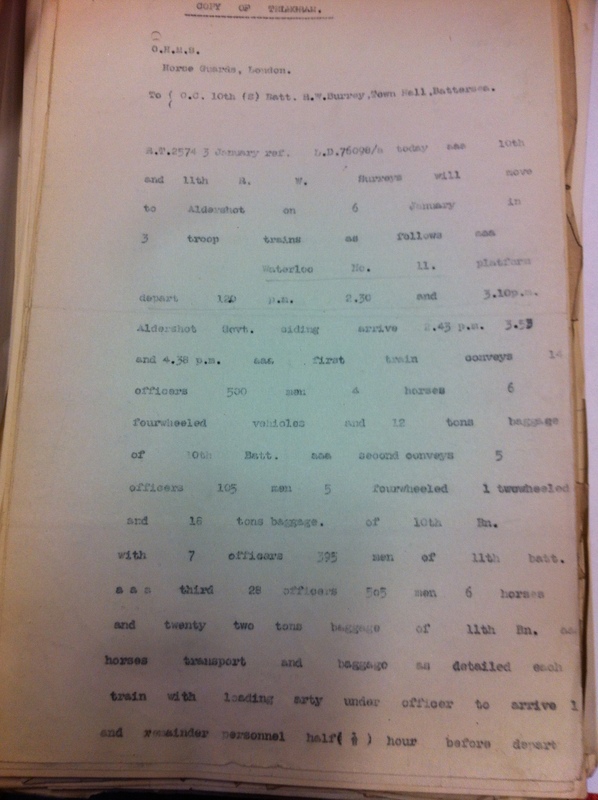 The telegram, a copy of which is in the Battersea Battalion file, gave the details of the mobilisation. A battalion consisted of up to 1000 men, so arrangements were detailed. 3 troop trains were to leave from platform 11, at 1.20pm, 2.30pm and 3.10pm going to the Aldershot Government siding (more information about the sidings can be found here – search the page for “Aldershot”, as there is a lot of other information there too). The first train was to carry 14 officers, 500 men, 4 horses, 6 four-wheeled vehicles and 12 tons of baggage. A further 16 tons of baggage belonging to the 10th battalion went on the second train, with 5 officers, 105 men, 5 four-wheeled vehicles and 1 two-wheeled vehicle, plus 7 officers and 395 men of the 11th Battalion. The final train carried 28 officers and 505 men of the 11th Battalion, along with 22 tons of baggage and 6 horses. The parties who were loading the train were expected to be there an hour beforehand, and all other personnel half an hour beforehand. Letters were sent out so that local Battersea residents could give the Battalion a send off, the South Western Star reports it as “All the borough seemed to have assembled in the neighbourhood of the Municipal Buildings to wish them godspeed”. The battalion depot was the Lower Ground Hall of the Town Hall, and lots of final packing had been done that morning, with the battalion itself due to depart at 10.30am. Enough people had come out to cheer the battalion on that the footpaths were lined all the way to Wandsworth Road, with the balconies and windows of the Town Hall packed with spectators. The procession was led by a band, then the battalion mascot – a sheepdog gifted by Dr Oakman of The Priory, Battersea High Street – before the officers (on horseback) and the men on foot. The Mayor spoke words of encouragement, and then the men marched to Waterloo, cheered along the way by the crowds, on their way to Aldershot – where they were to stay until May. There seems to be a feeling (whether it is justified or not) that the impression outside Battersea is that Battersea is not doing all that it ought to do to aid the Empire, and the council, who in common with all their countrymen are anxious to help in every way, deplore, or perhaps it would be more correct to say, resent this. The letter goes on to note that a recent recruiting column did not follow the streets advertised, which meant that some papers reported it having a cool reception in Battersea. In fact, residents were waiting in the streets which had been advertised, and so the reception was the fault of the organisers. Some local competition was also a factor, the Council did not “want it said that Wandsworth was more patriotic than Battersea”. A letter written by the Mayor and dated 28th September raised the same issue at length, which gives some of the background to the recruiting problem in Battersea. The Council was asked to raise a battalion on 21st April, and on 1st May the Recruiting Committee had written to say that they may not meet with much success, as many local men had joined the Camberwell Battalion and the 23rd County of London regiment had raised a second battalion and were in the process of raising a third – as this was based on St John’s Hill, many local men joined there. A letter from the War Office on 19th May referred to Lord Kitchener’s appeal for 300,000 more recruits, and the Mayor assumed that this superseded the appeal for a local battalion and that new recruits were to be used to fill gaps in existing battalions instead. He was anxious to do what was best for the Country, and sought guidance as to whether they should continue to try to raise a local battalion. The recruiting office in Battersea Town Hall was a general one, rather than solely for the Battersea Battalion, since June 1056 men had been examined by the Medical Officer, 647 of those were pronounced fit to serve but only 191 joined the Battersea Battalion – the remainder went to other regiments. The Town Clerk’s letter proposed a solution to the problem. Wandsworth had no General Recruiting Office, so Wandsworth officers dealt with local recruits directly, while Battersea found it harder to have them directed to the local battalion. The Recruiting Committee were still keen to raise a local battalion, so suggested that the General Recruiting Office should be closed in order for the Battersea Battalion to have a “better prospect of securing Battersea men who desire to enlist”. The letter also asked about the possibility of a grant to help with recruiting – an answering letter from the War Office declined the grant, as local recruitment should come from local funds, and there does not appear to be an answer to the question of the Recruiting Office. I write to express my regret at not being able to be present at your meeting tomorrow night to support the national declaration of our unflinching determination to carry on this terrible war to a conclusion which, please God, shall secure liberty and justice for generations to come. He noted that over 560 past and present students of St John’s College were now serving with the Armed Forces, and that both his sons at the Front, so that his non-attendance was due to a clash of commitments. His letter was read to the meeting, as were letters from Captain R M Sebag Montefiore, who was the former London County Council member for Clapham and Arthur Du Cros. That, on this anniversary of the declaration of a righteous war, this meeting of the citizens of Battersea records once more its inflexible determination to continue to a victorious end the struggle to maintain that ideal of liberty and justice which is the common and sacred cause of the Allies. The resolution was “enthusiastically carried” according to the South Western Star, and a second resolution in favour of conscription was also carried. Local members of the 23rd County of London Regiment were named in the paper, as the regiment’s actions on 25 and 26 May had earned several medals. They had captured three lines of trenches, and the full list of medals had just been published. Lieutenant L S Clinton had been awarded a Military Cross for his fearlessness, as well as being promoted on the field. Sergeant R H Oxman, Sergeant-Major T Hammond, Sergeant-Major A C Heggie, Sergeant A J Brian and Col-Sergeant F A Cooke were all awarded Distinguished Conduct Medals for bravery. The newspaper also reports on the opening of the War Hospital Supply Depot at Springwell House on Friday July 30th. London County Council had bought the house in 1914 intending to pull it down and build a school, but were allowing the Hospital Supply Committee to use it free of charge. The depot was said to be similar to that at Cavendish Square, with the object of making items required by hospitals to treat soldiers, including splints, swabs and bandages, with a combination of “carpenter’s shop for the use of gentlemen” and rooms “superintended by a lady who is expert in the special work”. Members were expected to give as much time as possible to working in the depot and to contribute 1s or 6d per week. Already 50 women were volunteering and some had lent sewing machines and given material. Donations were solicited, and could be given by Mr Saunders, Hon. Treasurer, of the London and South Western Bank at Clapham Junction. Last week’s meeting of Battersea Council agreed that the Mayor and Town Clerk were to administer the power granted to the Council under the National Registration Act. The National Registration Act 1915 provided for a register of all persons between the ages of 15 and 65, who were not members of the Armed Forces. More information about how it was used for recruitment can be found here. 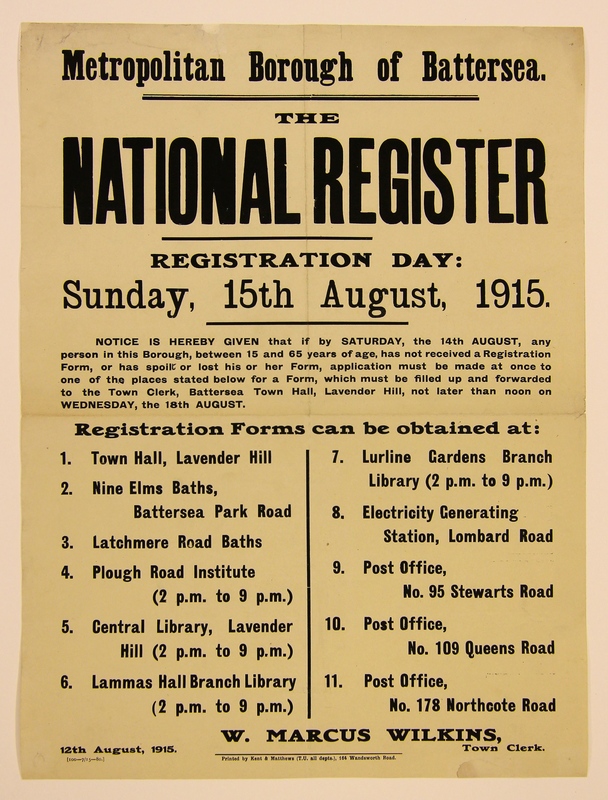 As a result, posters had to be produced informing everyone of the deadline for registration – an example from our collection is below. The meeting of the Executive Sub-Committee for the Wandsworth Battalion took place on 14th June 1915, held at the Town Hall in Wandsworth. This was the third meeting which had taken place, but the first for this particular sub-committee. One of the first matters for discussion on their agenda was the appointment of a Colonel for the battalion, and they had two possible candidates. The first candidate was Captain Burton, a 47 year old bachelor who was currently a non-gazetted Major. Since the outbreak of war he had spent nine months in the Paymasters Office and had then been appointed second in command of the 12th Battalion of the East Surrey Regiment (Rotherhithe). He was currently residing in the Charing Cross Hotel but would qualify for the position by living in Wandsworth. Captain Gethen was 64 and had lived in Tooting Bec Gardens for twenty years. He was a retired stockbroker, having also organised and recruited an 85 strong Mounted Detachment in the Boer War and was currently in charge of the Clapham Volunteers and an experienced Quartermaster. The post went to Captain Burton, at which point the minutes begin to refer to him as Major Burton instead. 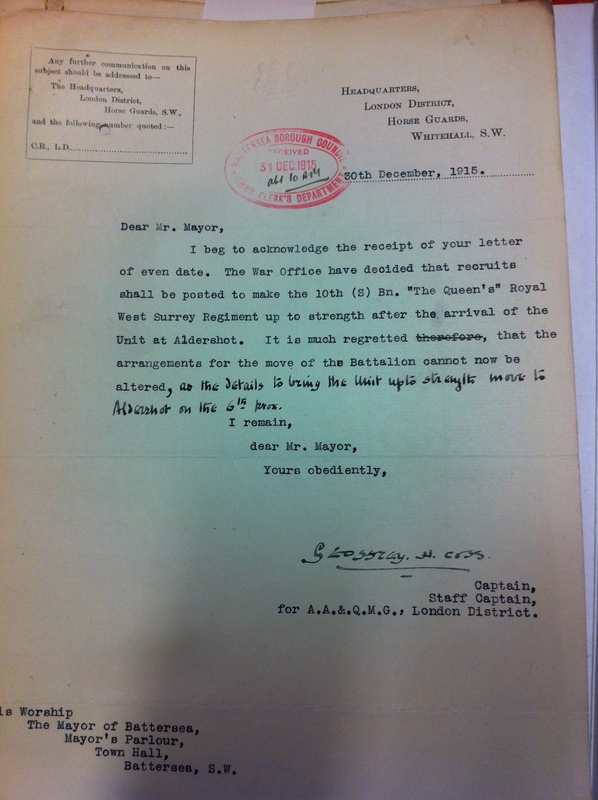 This was subject to confirmation by the War Office and the Major taking up residence in the borough. Second-Lieutenant Hoare, of Nicosia Road, aged 30 ¾, who had previously been in the ranks of the Seaforth Highlanders and was now in the 4th Royal Irish. R H Harker, Haldon Road, who was 28, married with two children and was sub-commandant of the Wandsworth and Earlsfield Athletic Volunteer Force. He had been recommended by Lieut-Colonel Haskett Smith as knowing the 1914 drill and having drilled a full company on several ocacsions. Mr Courtenay Bishop, a 36 year old widower with one child who was resident in Victoria Road, Clapham. He was an engineer with the 1st Battalion Surrey Volunteer Force. Second Lieutenant Greene, currently held an appointment with the 7th Dorsets but had been on active service in Northern France with the 15th County of London Regiment (Civil Service Rifles). He was 22, spoke French and had previously been a civil servant. Mr GW Buchanan was the director of a building contractor who lived in Trinity Road. He was 31 and an instructor for the Signalling Company of the 1st Wandsworth Battalion Home Defence Corps, who had also previously spent 7 years with the London Scottish. This was a busy week across what is now Wandsworth as the regular meeting of Battersea Borough Council took place, with the first reference in the minutes to the borough also being asked to recruit a battalion. The Mayor was authorised to raise a local unit of infantry and the Recruiting Officer was requesting offices in the Lower Hall of Battersea Town Hall to use as offices and a store. It may sound as if Wandsworth had been asked to recruit a battalion before Battersea, but this was the first Battersea Council meeting since 12 May, whereas Wandsworth’s Council meeting was on 19th May so the Council were able to authorise arrangements faster – the request to Battersea had already been in the local paper. Battersea’s connections with the Forces also included the headquarters of the 23rd County of London regiment on St John’s Hill, a connection marked in the meeting’s minutes by an invitation to all members and staff of the Council to a memorial service for the fallen of the 23rd in St Mary’s Church, Battersea, to be held on 12th June.